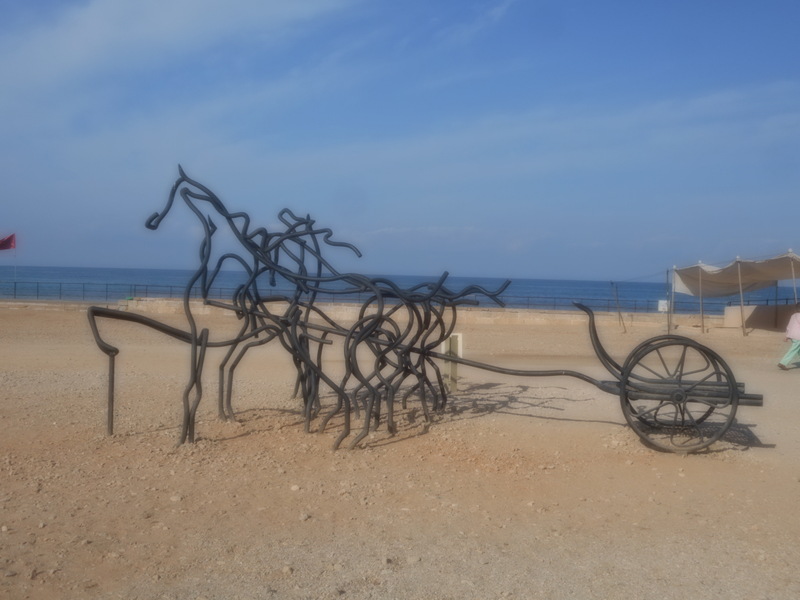 In looking at potential destinations in Israel, Caesarea was high on my list. King Herod the Great built his grand port there and the victorious Crusaders had erected a fortress there. In its archaeological remains stood glimpses of these heady days. But how to get there? Ultimately, I found a bus trip to Northern Israel that included a guided tour of Caesarea. Our guide Moody had much interesting information to impart. A piece of a huge column sat on the ground and showed a script chiseled on its surface. Moody said the script proclaimed that Pontius Pilate had directed this column be erected; Pontius had resided in Caesarea from 36 to 26 B.C. This meant he had resided some distance from Jerusalem; he had been there prior to the Crucifixion on official business. A signed marked the hippodrome ruins, as did an artistic rendering of horses pulling a chariot made of black pipe. I thought it captured the motion of the race. At King Herod’s death, the town became Caesarea Maritime, the capital city of the Roman Province of Judea. We passed the Roman public fountain from that time and admired the still standing statuary. The gray remains of an old building lie behind a wire fence. Moody told us we were looking at the site where Saint Peter baptized the first non-Jew, a Roman officer named Cornelius; he said this information was corroborated in the Acts of the New Testament. Cornelius reportedly told Paul about Christianity. By the ocean was a rock floor that was roped off. Moody said this was the floor of the holding cell where St. Paul awaited his transfer to Rome to be tried by Caesar. My understanding is that Paul was a soldier accused of starting a riot in Jerusalem and had demanded a trial in Rome, his right as a Roman citizen. Moody said that after 700 years, Herod’s port crumbled back into a fishing village. Next, in the late 1800s, Armenian Muslims fleeing persecution in Bosnia settled in Caesarea; they built a mosque. 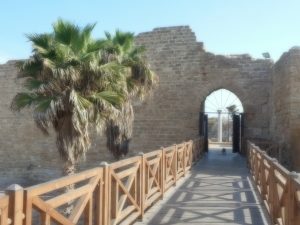 Now Caesarea is an archeological site, well worth a visit. TATTOO—Journeys on My Mind is available at Amazon and BarnesandNoble and iBooks.